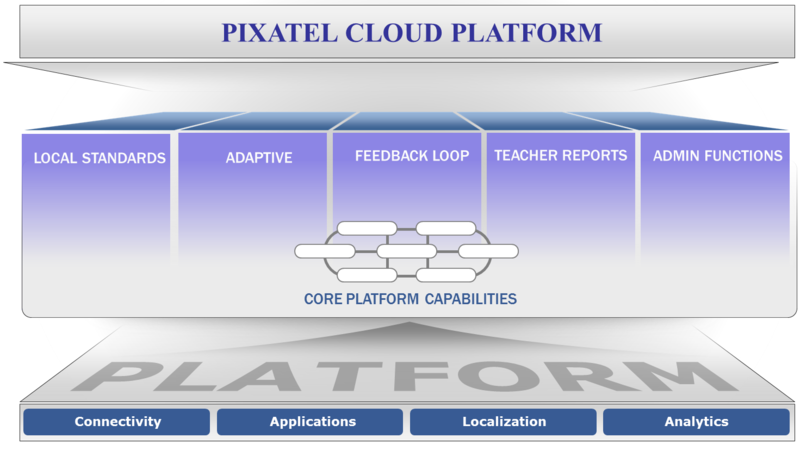 Pixatel’s E-Learning solution is a highly cost-effective, cloud-based technology platform that delivers adaptive educational content to students over inexpensive Tablet PCs. Our solution fundamentally changes Computer Assisted Learning —in terms of content, delivery, and cost. By using the Cloud as a delivery mechanism, we have the capacity to continuously deliver the right content to students in real time. Enabling students to access content through PC tablets makes our solution both inexpensive and reliable over traditional desktop based solutions that require infrastructure for regular internet connectivity and electricity. Our applications teach basic skills through an interactive game-like interface, in which students advance through levels at their own pace. In the course of doing exercises that gauge achievement, students are told why a particular answer is correct or incorrect so they can grow their understanding with each question. The adaptive nature of the applications tailors content for each student, providing additional reinforcement when needed. Teachers in each class have visibility into each student’s progress, time spent in different modules , and performance metrics at a granular level. The platform enables teachers to see where a particular student may need help and identify trends across the entire classroom. Similarly, school administrators have visibility across the entire school and program administrators have visibility across all sites. Our backend analytics track each student’s progress as they use applications— analyzing the effectiveness of the content being presented and its overall complexity relative to the curriculum. Equipped with this information, we can help educators (e.g. education ministries) construct a package of content best suited to their particular needs. Finally, updates to the content on tablets can be made instantly over the cloud platform. This allows for the ability to instantly upgrade to better content when it becomes available without switching costs. Teachers have raved about the potential of Pixatel’s Cloud Platform to drastically improve the quality of education by providing students and teachers a diverse set of additional educational content choices that are tailored to individual requirements.